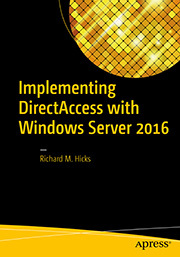 DirectAccess Troubleshooting and the Windows 10 Network Connectivity Assistant | Richard M. Hicks Consulting, Inc.
Richard M. Hicks Consulting, Inc.
One of the first places administrators look for information about the DirectAccess client connection is the Network Connectivity Assistant (NCA). The NCA is used to view current connection status and to gather detailed information that is helpful for troubleshooting failed DirectAccess connections. The NCA was first integrated with the client operating system beginning with Windows 8. Similar functionality can be extended to Windows 7 clients by installing and configuring the Windows 7 DirectAccess Connectivity Assistant (DCA). The DirectAccess NCA can be accessed by pressing the Windows Key + I and then clicking on Network & Internet and DirectAccess. Here you’ll find a helpful visual indicator of current connectivity status, and for multisite deployments you’ll also find details about the current entry point. 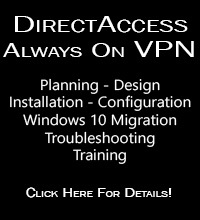 If DirectAccess does not appear in the list, open an elevated PowerShell window and restart the Network Connectivity Assistant service (NcaSvc) using the following command. If you receive the error “Failed to start service ‘Network Connectivity Assistant (NcaSvc)‘”, ensure that the client operating system is Enterprise or Education edition. The NCA service will always fail to start on Professional edition as it is not a supported DirectAccess client. The DirectAccess NCA also provides access to crucial troubleshooting information. Clicking on the Collect button creates a detailed diagnostic log file that is often helpful for troubleshooting DirectAccess connectivity issues. The option to collect a log, and email it to your IT admin will only be displayed if a support email address is defined in the DirectAccess configuration. To define a support email address, open the Remote Access Management console and perform the following steps. 1. Click Edit on Step 1. 2. 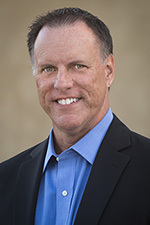 Click Network Connectivity Assistant. 3. Enter an email address in the Helpdesk email address field. 4. Click Finish to complete Step 1. 5. Click Finish to apply the changes. Microsoft assumes that an end user will be generating the DirectAccess client troubleshooting log and will be emailing them to their administrator. If an email program is not installed on the client, the following information is displayed. There is no email program associated to perform the requested action. Please install an email program or, if one is already installed, create an associate in the Default Programs control panel. If you wish to simply view the log file on the client and not email them, you can find the generated DirectAccess troubleshooting log file in HTML format in the following location. There are numerous reports that generating the DirectAccess troubleshooting log fails on Windows 10 v1709. DirectAccess administrators have been reporting that the process seems to fail during the creation of the log file, leaving it truncated and incomplete. To resolve this issue, open an elevated PowerShell window and enter the following command. The computer must be restarted for this change to take effect. If initial testing of this workaround is successful, the registry setting can be pushed out to all DirectAccess clients using Active Directory Group Policy Preferences. Hi Richard, any referece on what the SvcHostSplitDisable string is? It fixed our issue with collecting logs but I have no clue why. Essentially in this case, it’s ensuring the NCA service doesn’t get split away from it’s NetSvcs group.